Well it's March now and if you felt like we didn't really have a winter (December through February), you are somewhat correct. The Sierra and the Cascades had a warm winter as evident in Figure 1. The Cascades received approximately their average precipitation, but as you may have noticed, we did not (Figure 2). Figure 1. Average temperature departure from average from December 8 through March 7. Figure 2. 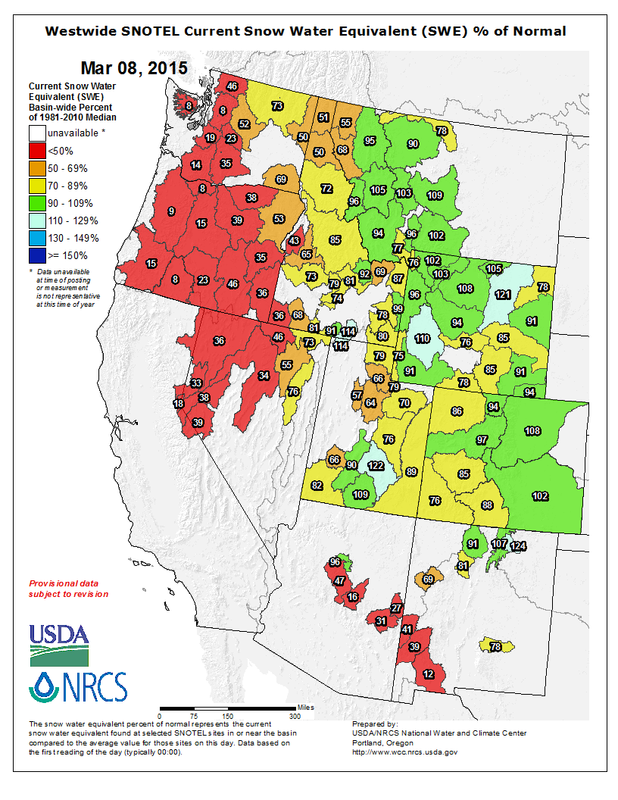 Water year (since October 1) precipitation percentage of normal. Record to near record winter temperatures (Figure 3) significant hurt snowfall totals leading to much below average snow-water equivalent percentages (Figure 4) and record to near record low snowpack in the Sierra (Figure 5). All of this means less spring skiing and a small window for that desired corn cycle we enjoy in March and April each year. 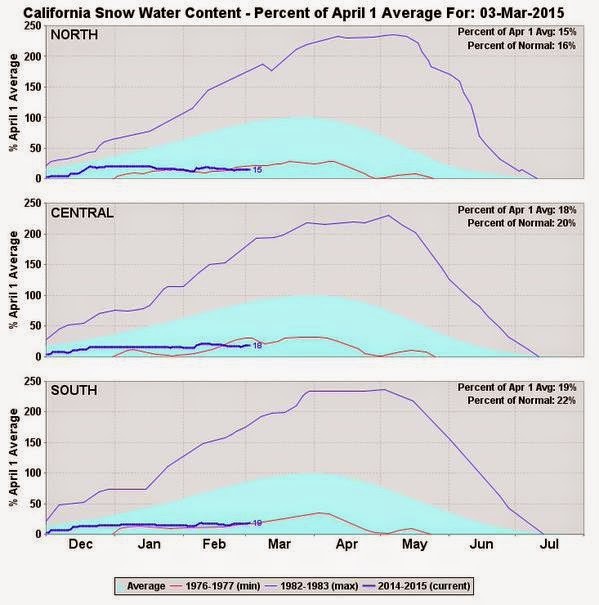 Low snowpack equates to quicker melting, which not only hurts our spring skiing, but has major implications for water especially in a historical drought. Figure 3. 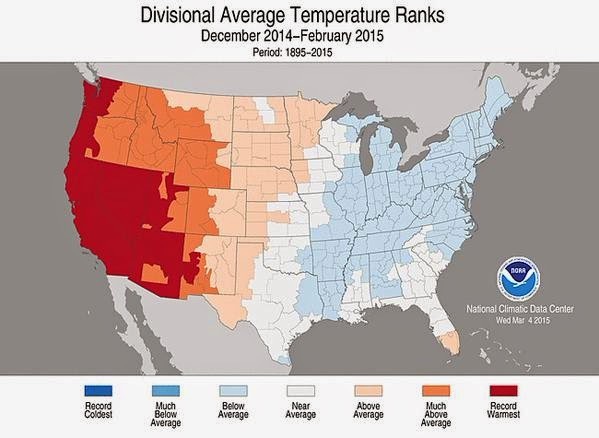 Average temperature ranks for climate divisions across the United States for December through February. Figure 4. Snow-water equivalent percentage of normal for March 8. Figure 5. 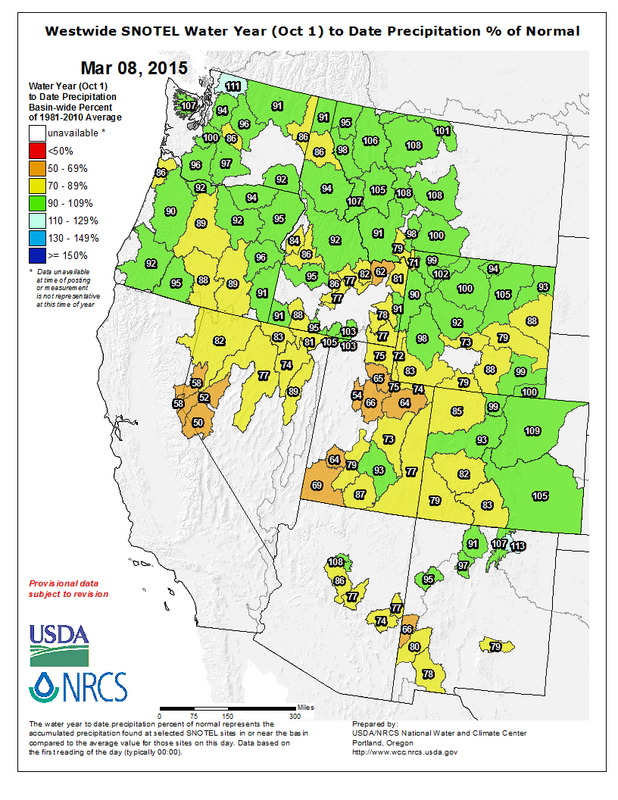 Snowpack percentage of average for March 3 and April 1. Also shows the minimum and maximum snowpack on record. Is this a sign of things to come for future winters? That is the million (trillion?) dollar question. Some climate projections under climate change forecast rising snow levels. Dr. John Abatzoglou addresses this question (and others) in a great blog post located here: https://climateinw.wordpress.com/2015/03/07/coming-soon-the-new-normal/. Is there any good news? Possibly. We do have a weaker storm moving through this week (Wednesday-Thursday). However, as of now, it's not anything to get too excited about. Additionally, models forecast the Madden-Julian Oscillation (MJO) to amplify and move into phases favorable for moisture transport into the western United States. However, the GFS model forecasts a larger MJO amplification than other models (Figures 6-7). Figure 6. MJO phase diagram with GFS ensemble forecast (green lines). Phases 6-8 can be favorable for western United States moisture transport. Figure 7. MJO phase diagram with statistical forecasts (green, pink, blue lines). Phases 6-8 can be favorable for western United States moisture transport. If this occurs, we can expect some atmospheric river events for the West Coast. Those events are wet and usually warm, especially during spring. Any precipitation is welcomed especially for drought stricken California. However, it probably won't do much for the snowpack and it could actually hurt it with any rain on snow.